INSET Days – On Wednesday 13th, Thursday 14th and Friday 15th February, school staff took part in In-Service Training Days. Over the three days staff were involved in meetings in Inverness and locally in the High School. These meetings allowed staff to discuss and deveop aspects of Curriculum for Excellence. Various meetings allowed staff to work with colleagues from other schools across Highland to discuss changes to courses that are replacing the current Standard Grade and Intermediate exams currently taught to pupils in S4 and S5/6. Meetings also took place with Primary colleagues to further develop links that will assist children progress smoothly between Primary and Secondary. Gairloch High School Drama Club was created this term and the first performance for International Women’s Day will take place in the Library (check the Library news for more information). The girls from S1 have been working really hard and Drama Club, run voluntarily by Helen Peat and Kirsty Thistlethwaite, takes place on Wednesday lunch-times, and considering the small amount of time we have, they are making great progress! Some of the key agencies have launched some new resources to mark the day, CEOP in particular have launched two new videos. You can view them here on their excellent education website www.thinkuknow.co.uk by logging in or you can hop over to their YouTube channel. Whilst it’s a great opportunity to raise the profile of the work going on to promote safer online worlds for children and young people, it’s important to recognise that this work and approach needs to take place throughout the year and across the curriculum in schools and at home. It’s a great way to continually reinforce messages such as not sharing passwords and thinking about the content you place online and how everyone has a part to play in creating safer online spaces. Sports Leadership – The following pupils took part in a Sports Leadership day certificate: Ross Wotherspoon, Chris Young, Ryan MacLean, Rory Nash, James Conniff, Cameron Moys, Sandy Garrioch, Ross Brogan and Innis Taylor. They learned how to organise and run sports sessions. They will now go on to help our Active Schools Co-ordinator and Young Ambassadors organise and deliver activities within our school. They each received a certificate and pin badge at Assembly – well done boys! 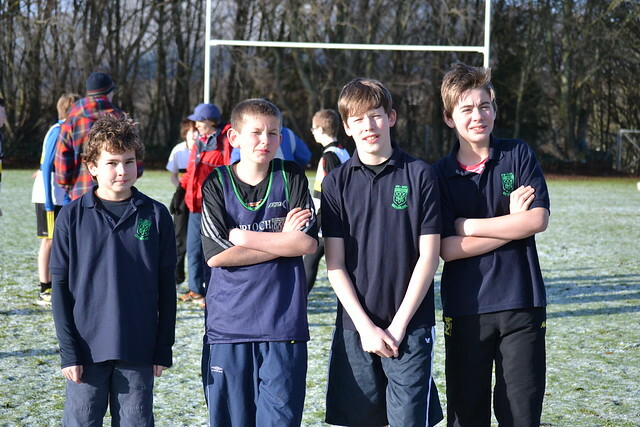 Ross-shire Schools Cross Country Championships – On a cold, wintry morning, a team of 11 runners set off from the school for the annual cross country championships in Alness. The sun was shining when we arrived, but it was cold and the runners had to cope with very slippery conditions. The younger competitors had to complete a 2.4km course: all managed this with Leonie Baptist placing highest in the girls’ race in 18th and Chris Adam for the boys in 34th. The senior girls’ course was 4km and Sofie Banister crossed the line in 14th place. Jordan Gorman took part in the senior boys’ 5km event and despite a bad slip on the ice, came in 8th place. All our runners have been training during PE classes and put in great effort on the day. Thanks to Andy Bowker for driving the minibus and helping to look after pupils at the event. Photos from the day are on the school website. You can see the pupils in action by clicking on the photo below. Future Chef Competition – Springboard Scotland held its West Highland local heat for the Future Chef competition at Gairloch High School last week, for children aged 12 to 16 years. The competitors were Ann Maclean from Gairloch High, Kayleigh Urquhart from Ullapool High and Ruby Howard from Plockton Academy. 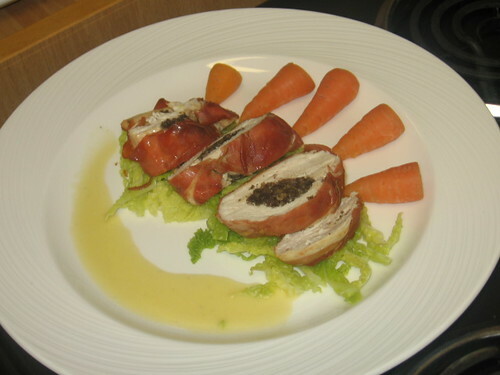 The standard of cooking was exceptionally high and gave the judges, Rohaise Rose-Bristow from The Torridon and Noreen MacKenzie from Myrtle Bank Hotel the very difficult task of picking a winner. After a great deal of deliberation they decided that Ruby Howard from Plockton just had the edge on her competitors. Graeme Strachan, the Springboard Youth Programmes Manager for North Scotland said that the facilities and hospitality provided to everyone from Gairloch High School was excellent and he would like to convey his thanks to all. It is his intention to make this an annual location for the schools that enter from the West Coast. Well done to Ann for her impressive performance on the day, she really worked to a high standard and did herself and the school proud. Her focus, skill and determination were really evident and I hope that she is as proud of herself as we all are of her! Thanks must also go to Kirsty Thistlethwaite who is employed by West Highland College and delivers the Hospitality course at Gairloch High School. 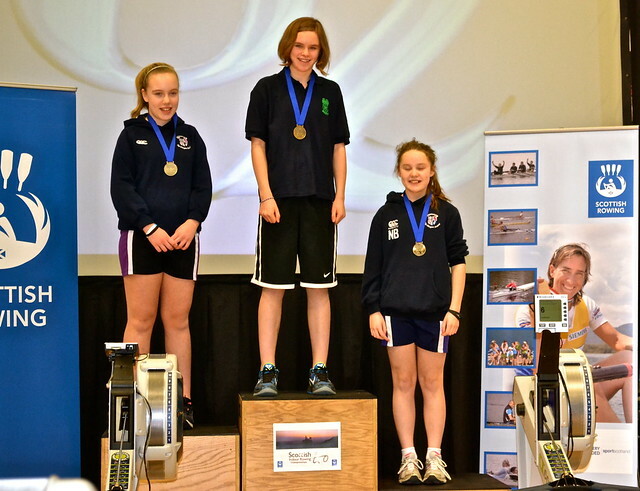 Scottish Indoor Rowing Championships – On Sunday 20th January, Sara and Eilidh Johnston and Siobhan Vickerstaff travelled to Heriot Watt University in Edinburgh to participate in the 2013 Scottish Indoor Rowing Championships. All three girls rowed personal best distances in their respective races. Siobhan competed in the tough J15, 5 minute race: she rowed 1158m which placed her 22nd out of 33. Eilidh had to row for 4 minutes in the J14 age group: 944m placed her 9th out of 23 girls. Sara’s distance of 493m in 2 minutes put her in 1st place, 11m ahead of the competition. This earned her a gold medal and the title of J12 Scottish Champion. GHS was the only Scottish Local Authority school represented at the event. All the other competitors were from large private schools and Scottish rowing clubs. Congratulations to all three girls for their effort and determination. New Comenius Project for the High School – It is hoped, during 2013-15, that the school will participate in its second Comenius Project. In order to start preparing for this, Miss Hunter spent 3 days in Turkey at the beginning of January, meeting with colleagues and helping to complete the complicated application for funding. Despite 4 foot snow drifts, she was able to visit a Turkish school, and spend some time with staff and pupils there. If all the interested countries are successful in their applications, we will be developing links with schools in Latvia, Turkey, Greece, Poland, Spain, Portugal and Finland. Watch this space! Malawi Partnership – Plans for our trip to Malawi by a group of staff and senior pupils are taking shape. Pupils who expressed an interest in this trip enjoyed a Malawian lunch in school just before the Christmas holidays, expertly prepared by Mr Hulme and his daughter Anna, who came back to school especially to cook for us. Pupils have submitted written applications to be considered for the trip and the final stage of the selection process is an interview with staff which will have taken place by the time you read this. Following the selection process, pupils and staff will be involved in fund-raising, to supplement funds already secured and contributions made by participants, and in team building activities, prior to the trip in October. The team will visit our partner school for around 10 days, where they will collaborate on projects with Malawian pupils and teachers, and will also spend a few days visiting other places of interest in that part of Malawi. Volunteer Driver – Our grateful thanks go to Allan Jones for driving the minibus to Poolewe/Aultbea for the last year so that pupils could take part in after-school activity clubs. S1 Grand Bring and Buy Sale – Saturday 9th March at 10:00am in the Community Hall. Stalls, Competitions and the BIG Raffle! We welcome any or all of the following donations: baking, books, DVDs & CDs, bric-a-brac, plants, electrical items in good working order, toys, clothes in good condition, jewellery, bottles and raffle prizes. We can auction anything within reason (antiques a specialty)! * Handed to any member of the school. * Delivered direct to the Community Hall on Friday 8th March between 3:30 and 6pm. * Collected by us – call the school office on 712275 and leave your details. Staff News – Congratulations and Best Wishes go to Mr & Mrs Whall on the safe arrival of Erin, a sister for Sofia. Cristie Moore has been appointed Children’s Services Worker for the Associated School Group. We look forward to working closely with Cristie in this vital role. 5/6 Prelims – These exams run from Monday 21st January to Wednesday 30th January and pupils have received copies of the timetable on their return to school. These exams are extremely important in preparing pupils for their final exams in May and June. To assist with revision, study club is available during the first two weeks of term to provide support beyond that already given in class. Christmas Quiz – The annual whole school quiz was held on the Wednesday before the Christmas holiday. The top five winning teams were from Maree which took first place overall. Kerry came second with Tollaidh third. Krypton Factor – The school ran its annual Krypton Factor competition on the last day of the Christmas term. Pupils stayed in their quiz teams and completed a series of mental and physical challenges, involving observation, mental arithmetic, computer games, sports (football, climbing and basketball) skills and the infamous “Superstars” style gym tests. This was a worthwhile way to spend the half day and thanks go to the staff who helped organise and run it. At the end, when all the scores had been collated, Tollaidh won (very narrowly), Maree second and Kerry third. Annual School Dance – The pipers got us off to a good start for a well-attended dance with The Roya Maclean band. The pupils all looked the part for the ceilidh in their evening wear, where there was non-stop dancing for the first half. Our own musicians entertained us at our supper and then it was back for more dancing with a bit of a break when Evan McPhail surprised us all with his ‘Gangnam Style ‘dancing during a dance off – fantastic! Thanks are due to many for the success of the night and include MacKenzie & MacLennan for providing transport to and from the dance, Andy Bowker and John Shearer for minibus driving; Mrs Fraser, Mrs Leitch and Mrs MacKenzie for preparing and serving the usual splendid banquet along with many other staff. It was a great night of dancing which finished around 11pm. 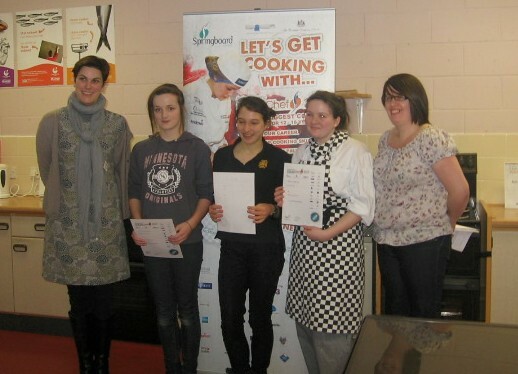 Future Chef Competition – Yesterday, Ann Maclean from S4 represented Gairloch High School in the Future Chef Competition. Also taking part in the event were pupils from Ullapool and Plockton. We have been involved with this event over many years but this is the first time we have been hosts. As you might be aware former pupil, Rosie Smith, was a runner up in the final of this event and is now training with Michel Roux Jnr in London. You will have to wait for the next edition to see how Ann got on. 2013 GHS Calendar – A few copies of the school calendar (displaying pupils’ art work) are still available from the school office and some local shops. Cost £6 and all proceeds go to school funds. Course Choices for S3/4 – Although there are four months before the timetable changes and S2 pupils embark on new courses, now is the time to begin thinking about this. Pupils have been introduced to the process of making their choices and the courses available in the coming weeks. Along with parents, they are to make their selection of courses that they wish to pursue in S3. By way of introduction to this process, S2 parents/carers were invited to a special Parents’ Evening on Tuesday, 15th January at which they were given information about courses and the coming years for their son or daughter in school. Below are the key dates in the process for pupils and parents. Wednesday, 16th January – Departments inform S2 pupils about subjects. Thursday, 17th January – S2 talk on options at which time the course choice list and option booklet issued. Friday, 25th January – Pupils return completed ‘Preferences’ list (these last two dates are earlier than those in the letter issued). Work starts on compiling and consulting on the option form. February – Consultation on option form based on pupils’ preferences and staffing and timetable needs. Week beginning 11th March – Interview with Pupil Support Teacher. Monday, 18th March – Reports issued along with option form and appointment letter for Parents’ Evening. Wednesday, 20th March – Appointment letter returned to school. Thursday, 21st March – Parents’ Evening with subject teachers. Monday, 25th March – Option form to be returned to Depute Headteacher. Should S2 parents have any queries about this, please contact the school. Legal Highs, Party Drugs and Alcohol Factsheet – We have received an information sheet for parents, teachers and carers. It is hoped that this will contribute to reducing harmful behaviour in young people by helping adults understand the issues and the signs of potential abuse. The leaflet has been distributed by Cath King, Health Improvement Policy Manager, The Highland Council, Health and Social Care Service. The Legal Highs, Party Drugs and Alcohol factsheet PDF can be downloaded from the school website or you can ask for a paper copy from the school office. Modern Studies Department – The third year Modern Studies pupils have been studying “Crime and the Law” and they were very lucky to gain first-hand knowledge of the topic recently. 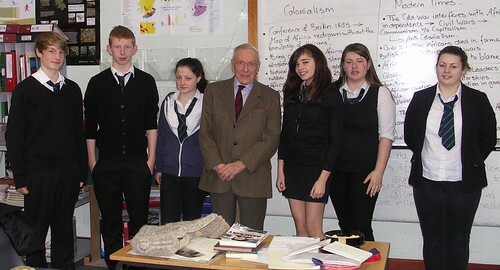 Sheriff Muir Russell kindly accepted our invitation to visit our school and talk about his extensive experience as QC. The pupils were very appreciative of the entertaining and also fascinating insights which Sheriff Russell offered into the Scottish justice system. We extend our thanks to Sheriff Russell for taking the time and effort to contribute to our Modern Studies curriculum. Holiday and In-Service Closures for Staff Training – School will be closed to pupils from Monday 11th February – Friday 15th February, inclusive. Date for your diary (advance warning) – The S1 Bring and Buy Sale is on Saturday 9th March. Pupils are asking if family and friends would please check to see if they have any suitable items for their Sale. If you are having a tidy up, and want to bring anything in, that’s fine – we’ll try to find some storage space! Also, if you need anything picked up, please contact the school (01445 712275) and our Janitor will arrange collection.